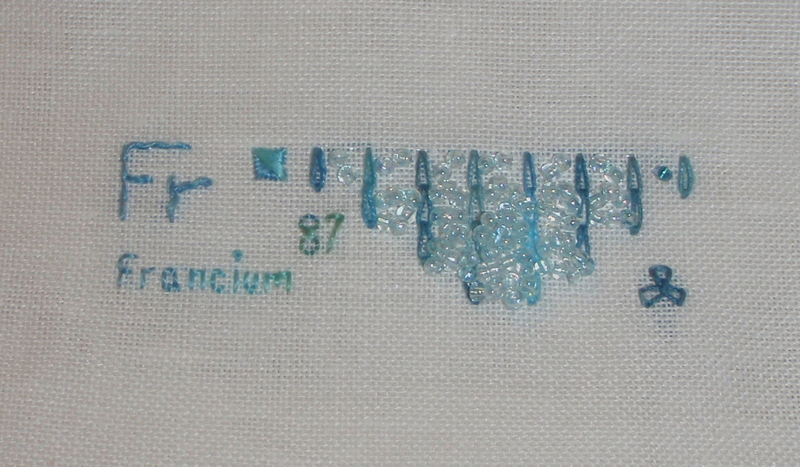 While stitching the first element on my periodic table the final design an pattern has been adjusted and polished. I needed to decide which stitches to go where and with which thread. 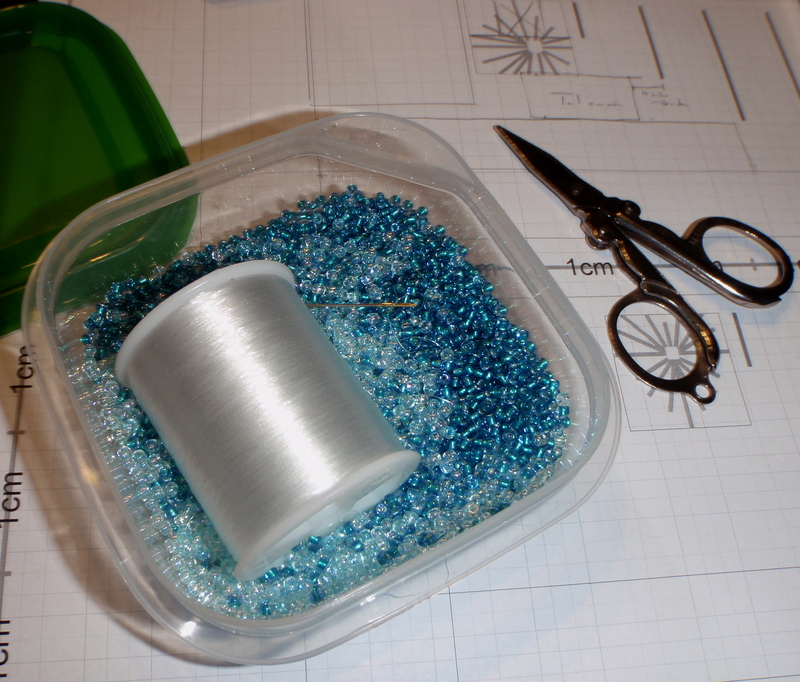 I ended with chain stitch, back stitch and wupped running stitch as my main stitches. I have abandoned the idea of each element having its ovn signature speciality stitch – finding over 100 different ones, which would look nice in the same size, seem like a very big project. My fiance helped me making the final decision, because he thought it would look to messy. I followed his advise and used his idea about indicating the fase each element is in at standard temperature and pressure with three different stitches. I chose to use pearls (in the size 9/0) for the electrons instead of knots for several reasons. Mostly because the fabric is semi transparent making the thread fron knot to knot visible. An other reason was my wish for more texture and variation in the design. Originally I wanted a pearl for every single electron in the orbital areas – but it got a little overcrowded. After asking other people, I removed the pearls and used a new approach in adding them. I every filled orbital I added one dark pearl and for every valence electron in an orbital I added one light pearl (for francium this was only one). 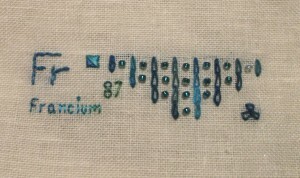 The full latin name in back stitch, with the silk thread. 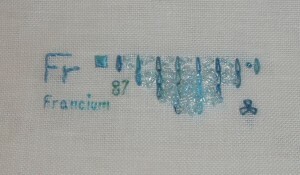 The short name in wipped running stitch, with the running stitch in the linen thread and the wipped part in the silk thread. Which fase the element is in at standard temperature and pressure(for francium solid), with the silk thread. Shells are devided with chain stitches and each orbital fills one chain stitch in the linen thread. 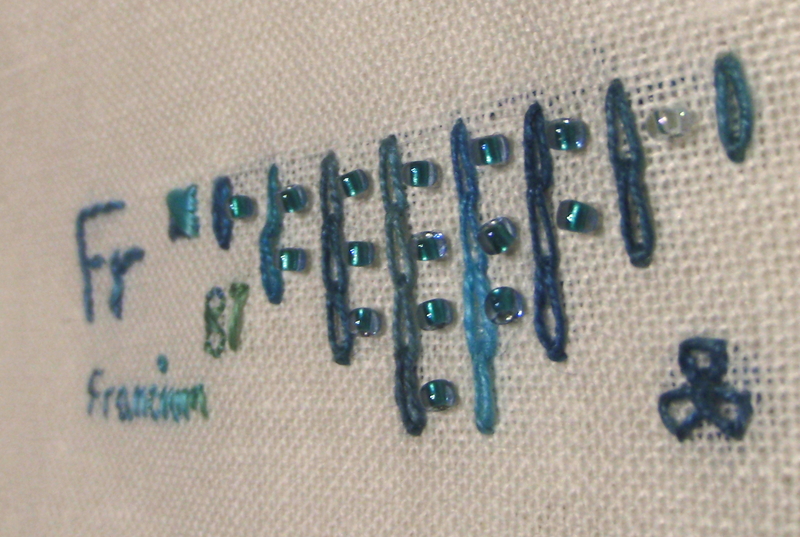 Element number in back stitch, with the silk stitch. 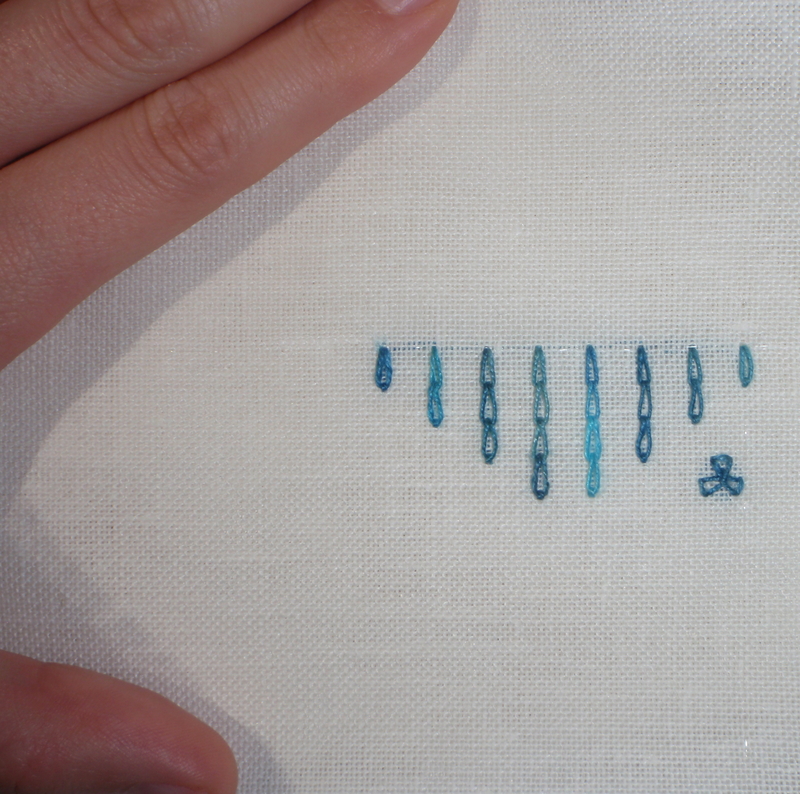 Radioactive symbol in linen thread. 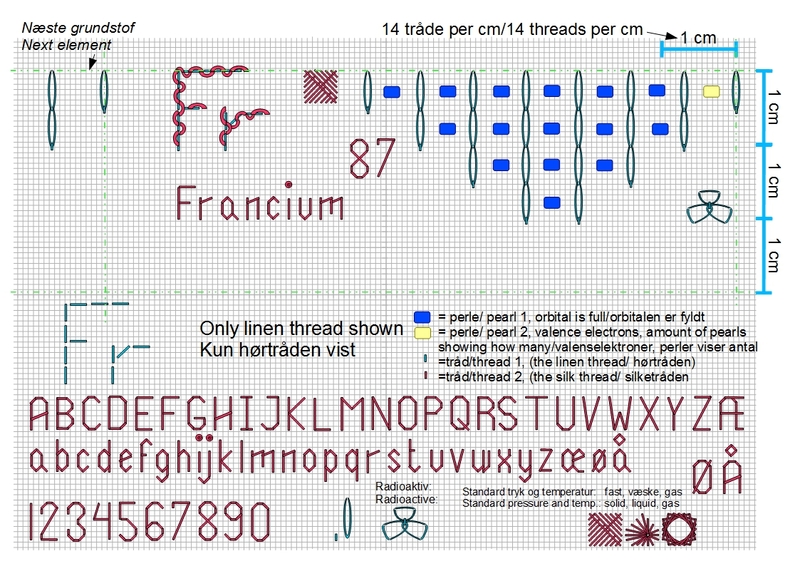 After stitching francium, I redraw my pattern getting the final version. 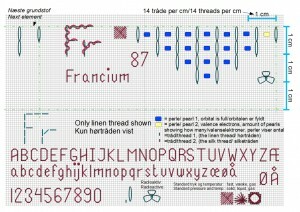 I have used francium as the example in this pattern. A pdf version of my core pattern can be found here. 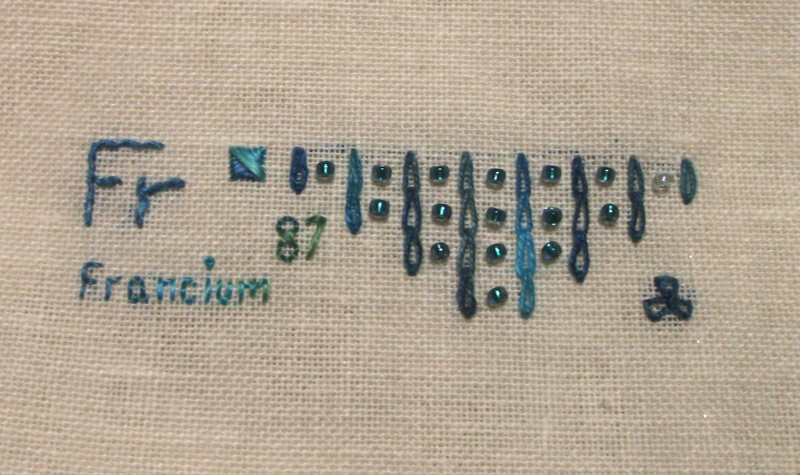 This entry was posted in Stitching the periodic table on January 14, 2014 by Tea. Wow, you’ve put a lot of thought into it, which says that this project is going to be fabulous when completed! Thanks for sharing, and keep us posted!